Interesting name, Leucoisa. I wonder what it means. It’s the name of one of the sirens in one version of the myth. Uh-huh. And it means “White One.” I thought it might. This must be that soldiers first (and last) mission: if you have a gun, and you are behind someone at a distance, you don’t run up to them!!!! Especially after they just stuck their hand through another guy’s chest! I get the feeling he doesn’t see her. Or doesn’t recognize her as the threat. He’s trying to run past her. I can’t read the character’s mind. I call ’em as I see ’em. He’s trying to run past her. Maybe she doesn’t have an infrared signature. He could still be OK…well, not NOW. That, on the other hand, is probably not a survivable wound. Deadpool hears the word “chimichanga” when a knife is stuck in his head, for some reason. Recurring joke in the comics. And I wondered when another story arc was going to be launched. I figured these school escapades were a breather. I wanna commend you for how well you conveyed her move here. Fight choreography is hard enough without having to depict it in ink. Bravo! Quite the misleading page title. Unless…. 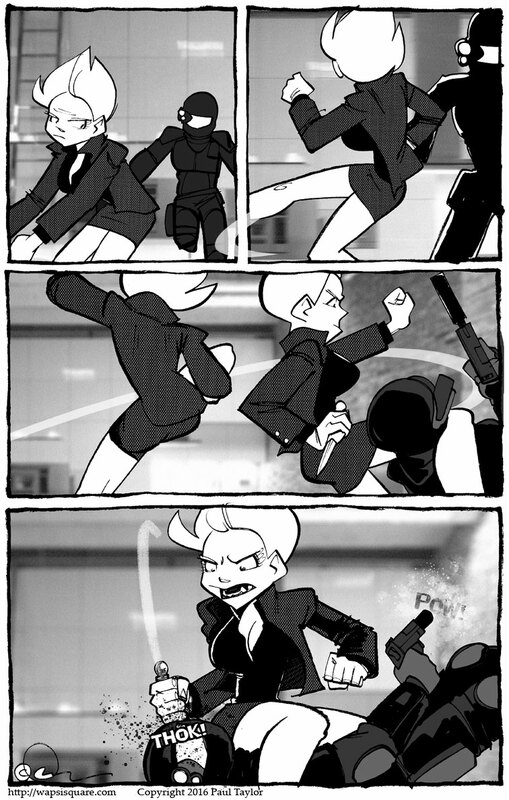 Nuthin’ like a hard-fightin’ woman in a classy business suit. She’s a siren – Atsali’s mother. …and i think she’s too cranky to sing at them. Or else they have wax in their ears and the Captain is tied to a mast. Mamastali kicking names and… wait, can I start over? Atsali’s mum has a name. Also, she knew Odysseus, apparently. Will that be alluded to? Wait, am I missing something? How do we know she knew Odysseus? I thought sirens were mortal. We know Sirens can be killed. Do we know they age? Hmm… So if the secret government organization knows of her siren powers, then the outfit would include earplugs. Also the artist can be excused not wanting to show a human face on someone getting a knife driven into their brain, even if we can assume they’re bad guys. They’re probably just soldiers assigned to that unit by our own military, after all. Seems like they didn’t come very well equipped after all. You guys, the real question is, why is she holding human form? Not enough time to change forms, perhaps?